Can you ever have too many healthy, fun and flavorful snack ideas? Snackable is a delicious compilation of original recipes that appeal to adults and kids alike. 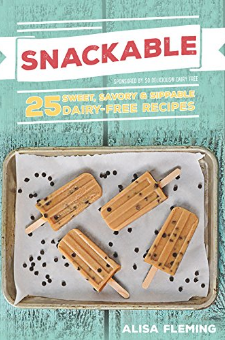 Sample recipes include: Everyone Loves Oatmeal Breakfast Cookies, Chocolate Chip Cookie Dough Pops, Trail Mix Truffles, Cuppa-ccino Muffin for One, Spicy Vegetable Ranch Salad, Thai Quinoa Bites, Crispy Creamy Cheesy Polenta Fries, Chips & Queso, Bananas Foster Shake, and Nourishing Spiced Mylk. As an added bonus, every recipe in Snackable is suitable for dairy-free, gluten-free, soy-free, peanut-free and vegan diets, and all but two of the recipes address tree nut-free needs, too.Alisa Fleming is the founder of the leading dairy-free website, GoDairyFree.org. Her credits also include the best-selling dairy-free guide and cookbook, Go Dairy Free, Senior Editor for Allergic Living magazine, and ten years as a special diet content and recipe creator for the natural food industry.